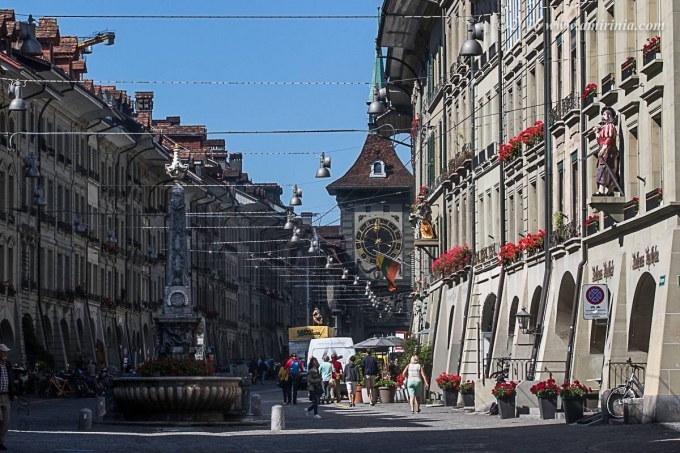 Bern is a busy capital city that manages to sustain a sense of calm and projects a charm that you could only find by living in a village. It is no wonder that whole city was listed as a UNESCO World Heritage Site. As the federal capital of Switzerland since 1848, it stands on a narrow hill surrounded by the Aare River which is on three sides. The old medieval town was originally built surrounded by woods, but a major destructive fire in 1405 transformed it into a new city rebuilt in stone. I was amazed to find buildings, predominantly coloured in grey, different to other European cities that I have seen where they are mostly painted brightly with various shades and colours of white, red, blue and yellow. The uniformity of light grey throughout the old town has created a distinctive character.